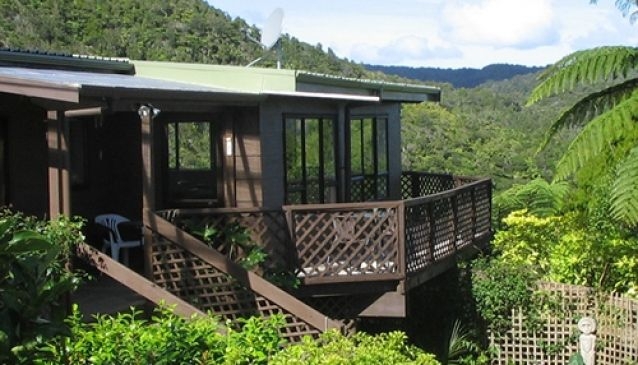 Lone Kauri Lodge is a secluded bed and breakfast accommodation, offering bush and sea views from its tranquil location in the Waitakere Ranges Regional Park. An ideal escape from the city, Lone Kauri Lodge offers two ensuite rooms with separate entrance, a guest lounge, complimentary Wi-Fi, stunning views, and a hot spa pool under the tree ferns and stars. Less than an hour's drive of the airport, guests can enjoy convenient access to the walking tracks, waterfalls and stunning scenery of the Waitakere Ranges. While close by are the beautiful west coast beaches, including Piha and Karekare. For keen walkers wanting to hike all, or part of the Hillary Trail, Lone Kauri Lodge Karekare, in conjunction with Bush Sand and Sea B&B at Bethells, can not only provide you with comfortable accommodation after a long day's walk, but organise all your transport requirements. The Lone Kauri Lodge offers Gift/Accommodation Vouchers which are valid for 12 months from the date of issue and subject to availability.